Proper breathing is not just essential in preparing you for meditation. It’s actually a practice of meditation itself. With breathing being so natural, it’s almost taken for granted. Yet we access our vital force, also known as Prana, through the breath. So instead of just another “how to” book on breathing exercises, Meditation Portal recommends [easyazon-link asin=”160407440X” locale=”us”]The Power of Prana: Breathe Your Way to Health and Vitality [/easyazon-link]. [easyazon-image align=”left” asin=”160407440X” locale=”us” height=”160″ src=”http://ecx.images-amazon.com/images/I/51LuOkUEqLL._SL160_.jpg” width=”107″]This book is about breathing your way to health and vitality. As one of the most highly rated meditation books by Amazon readers, it provides a higher understanding of the breath and how it energizes the body. How these breaths stimulate your nervous system. And in ways that maximize your absorption rate of this vital force. Who can’t use a little help to instantly recharge during the day! With the typical life-span increasing, it’s important to do all we can to enjoy more long-term health benefits. This is a great book, and it is VERY readable! It has a blending of yoga and Chinese philosophy. I really like the combining of philosophies and the simplicity of everything in this book. This material is written in a direct, easy to read format. It is informative and compelling. For the novice to PRANA, it is fully explained and it flows easily. Top reviewer, ‘K. Salinger “MBA, RN, RRT, sFNP” ‘ said that the book is a “good synthesis of breathing techniques from different practices”. While this book uses PRANA in the title, it is not specifically Indian in it’s approach. The author has studied different breathing practices and synthesized them to some extent into a practice as outlined in this book. In addition, he has general wellness & lifestyle suggestions that seem pretty “mainstream alternative” in their approach (likely the result of the physician co-author?). For me, the synthesis of breathing modalities into the style author CO has created is great. However, the more generic lifestyle and wellness advice is so very “mainstream acceptable” that it wasn’t at all useful and I glossed over all of that. Folks who are pretty well read in alternative medicine will also likely be disappointed in the lifestyle/wellness recommendations, but someone completely new to the alternative world might find it useful. Buy it for the breathing techniques but skip the lifestyle/wellness suggestions (unless you are new to alternative healing). 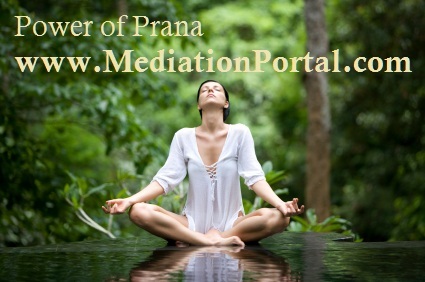 SUMMARY: Like meditation, taking the time to develop the power of prana can be powerful. And a worthwhile practice on its own. This book, The Power of Prana, gives you just what you need to begin this important, life-enhancing practice now. [easyazon-cta align=”right” asin=”160407440X” height=”28″ key=”amazon-us-wide-orange” locale=”us” width=”176″] [easyazon-link asin=”B005E833CA” locale=”us”]Click here to buy your own copy and begin these simple yet effective breathing techniques yourself[/easyazon-link]. After you’ve read The Power of Prana, we’d love it if you’d come back and leave your own review in the Comments section (at the bottom of this article).